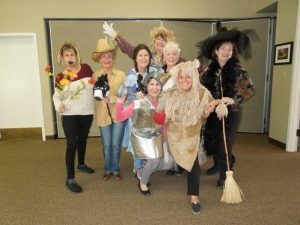 Show on the Road is a traveling group of volunteers who visit various assisted living facilities throughout Contra Costa County. Their goal is to provide fun and enthusiastic entertainment for the residents and to bring a bright spot into their day. They schedule performances twice a year during the fall and spring, presenting short, humorous plays with singing and sometimes, a dance step or two. The stories within the skits are original and imaginative – not to mention lots of fun. Following the performances, the cast encourages participation in a sing-a-long with several songs that most of the residents would remember from days gone by. They are always happy to see many of the residents join in the singing. Show on the Road is as rewarding for the performers, as it is for those in the audience. If you are interested in scheduling a performance, please contact Assistance League.